Today’s showers are larger and more customized than ever before. The design of your shower starts with a choice of showerheads with a variety of functions from massage to misting. Custom body sprays make each shower a new experience. Digital controls allow each family member to have their own personal settings for the shower. Think about where in your bathroom you most want to linger during a long, relaxing soak. If you have a view to take advantage of, a long bath is even more luxurious. Choose from free-standing or built-in bathtubs to suit your personal taste and the aesthetics of your home. 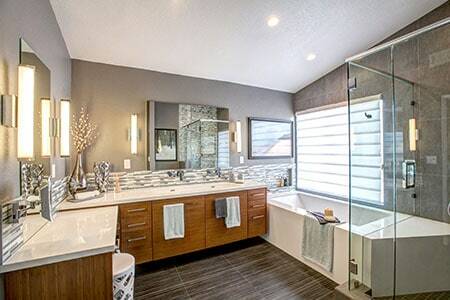 To keep your bathroom design serene, you will want to plan for maximized storage to minimize clutter. When you use your bathroom to get ready for the day or an evening out, a distinct area with well-planned lighting and mirrors will help with a smooth and organized transition. Some respond to an energetic palette while others prefer more soothing tones. Carefully selected materials with interesting textures and surfaces make your bathroom design feel like a unique retreat from the ordinary demands of the day. 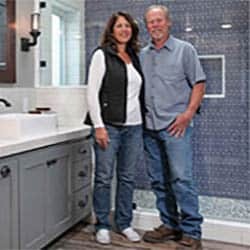 There’s nothing like a custom bathroom design to make everyday life a little more pleasurable and inspiring!